Does Europe Really Depend on NATO? The recent statement of NATO Secretary-General Jens Stoltenberg on the European Union’s dependence on NATO for defense and security is based on real facts. The United States pays 72 percent of NATO’s total military expenses, while the United States, Canada and ‘Brexiting’ UK combined pay 80 percent. It should be noted that the EU’s dependence on NATO for defense and security compels the EU members to adopt the military-political agenda set by Washington and remain disciplined allies. Politically, the United States relies not only on its most traditional allies – the UK and Canada – but also Baltic countries and some other NATO states whose institutional and political weight is not proportionate to their real military and economic power. It is also important to consider how non-NATO members – primarily, Finland, Sweden and Austria – are being drawn into NATO’s orbit through their cooperation with the EU. The United States is prodding its European allies to increase military spending and fulfill the 2-20 goal with simultaneously maintaining the leading role of the US and NATO. Washington wants to avoid a repeat of 2003 when France and Germany joined Russia in strongly objecting to the US invasion of Iraq. In this context EU military structures, as well as structures that are not part of NATO or the EU, such as the Franco-German brigade, have the right to exist but should work in synergy with NATO, not at cross purposes. 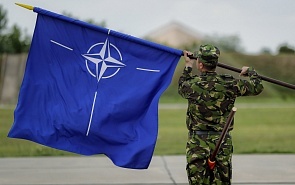 The situation is generally favorable for NATO. Brexit is encouraging Paris and Berlin to implement its long-standing plans to develop the EU’s own defense institutions. However, relations between Russia and the leading EU countries rapidly deteriorated after 2014 and tensions will persist for a long time. There are no grounds to expect the end of anti-Russian sanctions, a settlement of the Ukrainian conflict that is acceptable to the EU or considerable improvement in relations between the West and Moscow in the short term. The deterioration of relations with Russia facilitated the growth of solidarity inside NATO and the upgrading of NATO-EU cooperation. This and the unequivocally pro-US orientation of some EU members will block any attempts by Paris and Berlin to build common European systems of collective defense and security structures that would be independent from NATO or adopt a military-political agenda that would contradict the agenda adopted in Washington and Brussels. The absence of serious threats and lack of interest in increasing arms spending was initially a major obstacle to moving forward with military spending. Now the threat of international terrorism has become fairly real for many European nations; the migration issue has not been resolved and the tale about the notorious “Russian menace” is gaining steam. This is accompanied by Washington’s attempts to pressure its European allies into increasing their arms spending. All this will lead to more active involvement of the EU and its relevant agencies on defense and security matters. But this should be taking place under NATO’s de facto control, while the EU’s role should be limited to niche functions. This is confirmed by all recent events, including the signing of the EU-NATO Declaration in July 2016 in Warsaw and the adoption of the EU Global Strategy Implementation Plan on Security and Defense in November 2016 and the European defense plan of action. The serious decline in Russia’s relations with the West has breathed a new life into NATO, which returned to its traditional role, the containment of Russia. Moscow’s commitment to national interests and will to promote them reaffirmed in 2008 and 2014, in addition to the military modernization, which proved to be efficient. All of this is perceived as a challenge for NATO and, especially, the United States to respond to. Statements by NATO leaders about their desire to improve relations with Russia should be taken with a good dose of skepticism. There are no grounds to expect NATO to make concessions or recognize Russia’s national interests. Brussels finds it very difficult to accept that Crimea will have to be left out of discussions of the Ukrainian problem. At the same time Russia is not going to make any concessions that are directly opposed to its national interests, for instance NATO’s further expansion or any talks on Crimea’s status. At the same time it is possible to hope for some restraint, predictability and moderate pragmatism from NATO in relations with Moscow. No country will benefit from the further deterioration of relations or an arms race, not to mention a direct armed conflict. The buildup of the US and NATO presence in Eastern Europe does not yet pose a direct threat to Russia but are an alarming and vexing factor, especially in the context of the continued deployment of US missile defense in Europe and disagreements over the INF Treaty. Every prerequisite is in place for the limited development of the EU’s defense institutions in the foreseeable future. But this will hardly undermine NATO’s positions or create new threats for Russia. Russia should continue active military-political dialogue at all levels both with NATO and the EU. But there is little hope for substantial progress or improvement in relations.